If you’re seeking an exercise bike that allows you to have a low-impact and no-impact, you’re going to want to sit down for this and begin reading. Recumbent bikes are for those that have body issues (in terms of pain and posture), as well as those that are older in age. 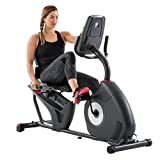 In this article, we’ll talk about the benefits of the best recumbent bike, factors to consider before purchasing a recumbent bike, and tips to know before buying. Purchasing a recumbent bike is for a very specific target audience, and it’s important to identify if you are within that demographic. It’s somewhat a secret that recumbent exercise bikes can provide a better cardiovascular exercise. 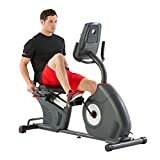 The aforementioned is due to the areas that the recumbent bike works out, which includes large muscles such as the glutes, thighs, hamstring, and more. You’re able to improve the strength and health of your heart. Let’s not forget your lung capacity. If you’re not focusing on exercises that improve and enlarge the capacity of your lungs, you’re not working out correctly. You’ll be able to push hard and go “further” next time on that exercise bike, which means you’re going to be able to get more oxygen as you work out. As a result, your body’s stamina increase immensely. Because of the utilization of your muscles when using a recumbent bike, your thighs and glutes are able to create more body mass. When you have more body mass in terms of muscles, you’re able to burn more calories and lose weight much easier. Let’s not forget about the obvious increase in strength when you’re building up your muscles. The aforementioned leads us to our next benefit: the elderly. Senior citizens who wish to remain healthy, but don’t have it in them to use a normal exercise bike tend to go for ones that are recumbent. The strength that can be built within their core and legs will allow them to continue to function as normally as possible. It’s much easier to recover from as well, so the elderly body won’t feel as harmed or sore post-workout or weeks down the road. A workout gone wrong with the elderly is a workout that could potentially be fatal. Take the right route; go recumbent. It’s also worth mentioning that there is less stress on the hips and knees, which ensure that anyone who has bone problems or posture problems will have less recovery time than machines that aren’t recumbent. Whether you’re elderly or have vertigo problems, being able to stand up normal after using an exercise machine is essential. The comfort and safety of your body post-workout will determine whether or not you’re going to continue with your workout. Upright cycling is much less safe due to the lack of back support and the height difference in comparison with a recumbent bike, and sometimes, those are essential when it comes to the safety of the user. Not everyone has the posture and core for an upright, and that’s okay – it’s human nature to be different than one another. 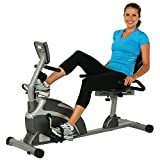 Recumbent bikes seem like a relatively simple piece of gym equipment, but the truth is they can vary dramatically in price depending on how many bells and whistles you want. Here we will outline our top 5 favorite recumbent bikes out of the dozens of options available to you online. The biggest factor we considered when making our selections was value/quality for the money. Take a look! 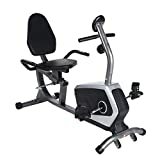 Phew, after looking at the listing for the Schwinn 270 recumbent bike, you may want to grab a drink and sit down. The number of features that come equipped with this machine makes the price much more attractive, as the aforementioned is practically commercial grade equipment. With a dual track LCD window system, you’re able to monitor different feedbacks of display (up to 13) – that’s an incredible amount. Beyond this, you’re able to customize your user profile, and the machine allows up to four different user profiles. You’re able to record and track your goals while allowing you to export your data via the charging USB and your computer, fit watch, or another program. There are also 29 different programs and 25 different levels of resistance that come with your bike. 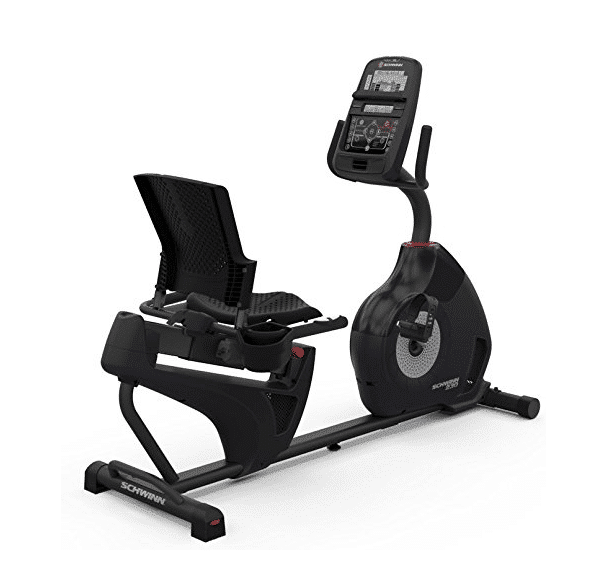 Track your progress, monitor your goals, and reach the finish line with this stationary, recumbent bike. Perfect for those looking to get their strength and endurance back on track. 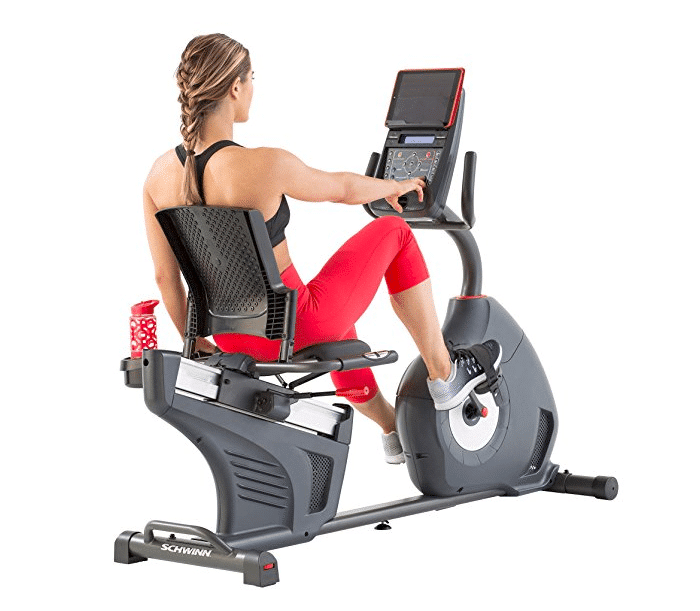 We can’t even begin to name all that this machine has to offer, as there are so many advantages, but one of the leading reasons why people purchase this recumbent machine is because of the fitness tracking and data exporting features that the Schwinn 270 offers. Four different people can use this machine and track their progress, allowing everyone in your household to keep motivated and check in easily with how their progress is going. The 25 different levels of resistance can cater to a wide variety of users, and you don’t have to settle for being miserable and harming your body. The weighted flywheel also ensures that the machine rides smooth and quietly – what else could you ask for? We’re going to be honest, upfront, it doesn’t seem like there are too many disadvantages of the Schwinn 270 recumbent machine. After digging extremely deep to find anything that one may find unsettling during their search for the best recumbent machine, we were able to find that the assembly is a bit hard by yourself – and can take upwards of 90 minutes by yourself, even if you know what you’re doing. Have an extra set of hands to ensure that you’re able to put it together seamlessly. Another machine with an incredible number of features, this price is a little more forgiving than the last. Featuring a reduction in stress on your spine and joints, you no longer have to dread the recovery time or post-workout feeling. You’ll feel energized, relaxed, and less stressed as you continue on your day or go to sleep. There’s also a large LCD screen that allows anyone to easily read what is has to say (even those that are hard of seeing). You’re able to see your distance, burned calories, speed, heart rate info, and even time within this screen; although at this point, there are little machines that don’t have this information. There is a 300-pound weight limit, and an 8-level magnetic tension control system. There are quite a few advantages, including the three-year manfucturer’s warranty that comes included. Beyond this, you’re able to choose whether or not you want an equipment mat to ensure even more stability within this machine. There are 8-levels of magnetic tension control to cater your workout to what your body desires, and the recumbent aspect ensures minimized stress on not only your joints, but your spine. We think this is fantastic for those who have trouble during recovery sessions or post-workout resting. There aren’t too many disadvantages, but if you’re over 300-pounds, unfortunately, the weight limit cannot be exceeded. 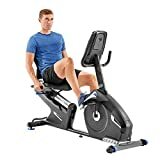 For those that are trying to get their weight back on track with an easier machine like a recumbent machine, you may want to try searching “big and tall”, as I’ve had more experience that way. One of the primary features that this recumbent machine comes with that others don’t is the acoustic chambered speakers. There’s nothing worse than someone trying to enjoy sound or the alerts from the machine when it sounds tinny. In return, you won’t have to get used to terrible acoustics, and you can enjoy your workout. Speaking of YOUR workout, you’re able to customize your profile entirely, and so can three others. There are 29 various workout programs you can cater your body to, and 25 different levels of resistance for those that need to change it up quite often. With the ability to cater to up to four people’s progress at once, everyone you know in your household (or your friends) can come over and enjoy some private fitness. Instead of working out in front of an abundance of people you don’t know, you can enjoy tracking your progress in a more professional manner at home. Use your data alongside your fit watches and your apps to ensure you’re making the most out of your workout. If you’re using this to help somebody get back on their feet health-wise, you’re able to monitor their progress over time; better tracking for better health. Beyond this, the frame alone has a 10-year warranty, there’s 2-years of mechanical support under the warranty, 1-year of electrical warranty, and 90-days warranty on the labor. There aren’t too many disadvantages of this product; however, there is a weight limited of 300 pounds. Unfortunately, while it helps those with their joints and back, there are other pieces of machinery that will have to cater to those of a larger stature. It’s worth mentioning that as long as you’re within the limits of weight that this machine suggests, the performance is phenomenal. 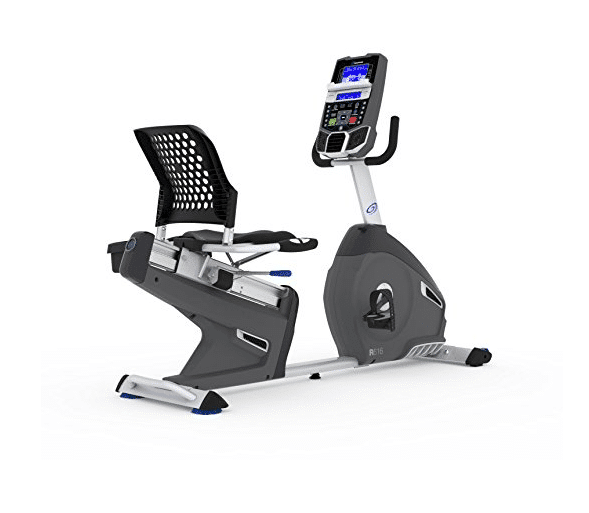 Track your goals even easier with the Scwhinn 230 recumbent bike. You and one other person are able to log their progress without interference, and with ease. There are 20 levels of resistance that align perfectly with the inertia of the high-speed performance within the machine. Beyond this, you’ll be sure to know that your workouts will be smooth and quiet thanks to the flywheel; however, the levels of resistance match perfectly with said flywheel weight. There are 22 various programs, and two different profiles that you can track your progress within to ensure your goals are being kept and tracked for your entire journey. There are also 13 different display feedbacks thanks to the dual track two window system that’s LCD. We’re just going to say that there are a ton of advantages, including the option to have assembled by an expert. The charging USB port and data exchange options make it easier to sync with any programs or devices outside of the machine. There is also optimal goal tracking, programs, and levels of resistance that you can cater your workout with. With how much is going on within this machine, the price is impeccable, especially if you’ve seen the prices of some of our first two machines. The warranty includes 10 years of coverage for the frame, 2-years of coverage for the mechanical aspect, 1-year of electrical coverage, and a 90-day labor warranty. There are 3-speeds for the fans of this machine to ensure that you’re being kept cool the entire workout. We like to say good things about all products, but it’s no secret that every machine has a disadvantage. Unfortunately, there is a weight limit on the machine; that being 300-pounds. As long as you’re under the weight limit, the machine’s performance isn’t hindered; but if you’re over the limit and decide to purchase, the warranties are automatically void because of the weight limit being exceeded. Designed for seat adjustment to handle a weight capacity of 350lbs. The hand pulse sensors included allow you to track the heart rate readings of the user over time, whether it’s you that it’s monitoring or someone that you’re watching over. The seat adjustment system ensures that you can fit someone up to 350lbs. with ease, which is unlike any other we’ve listed. The sleekness of this machine also allows this machine to be less bulky and ensure that you’re going to be able to fit this machine within the comfort of your own home with ease. One of the primary advantages of this product is that the weight limit is extended, and allows for anyone up to 350lbs. to use this piece of fitness equipment with ease. There’s actually nothing worse than trying to better your health but are stopped by a weight limit of a piece of fitness equipment. There aren’t too many disadvantages, as the weight limited is extended, there are hand pulse sensors and a sleek design for an improved experience, along with an adjustable magnetic tension system. However, those that are looking for side support won’t receive it with the design of this recumbent machine. Your Budget: This is a no-brainer – your budget is key when making any decision for purchasing. If you can’t afford the long treks to the gym, as gyms are getting more and more expensive, investing in a one-time purchase for a recumbent exercise machine may be something you want to look into. While it may be a sort of large upfront purchase, you’ll be saving much more by only purchasing one time vs. a recurring, unused gym bill. Your Space: If you own a hospice care or elderly home and need a reliable recumbent bike for your clients, this article may be your go-to. Maybe you’re recovering from an injury and are young, but still need to think about space in your apartment. It’s important to look at the dimensions of each piece of machinery while taking into account the space you have in your home. 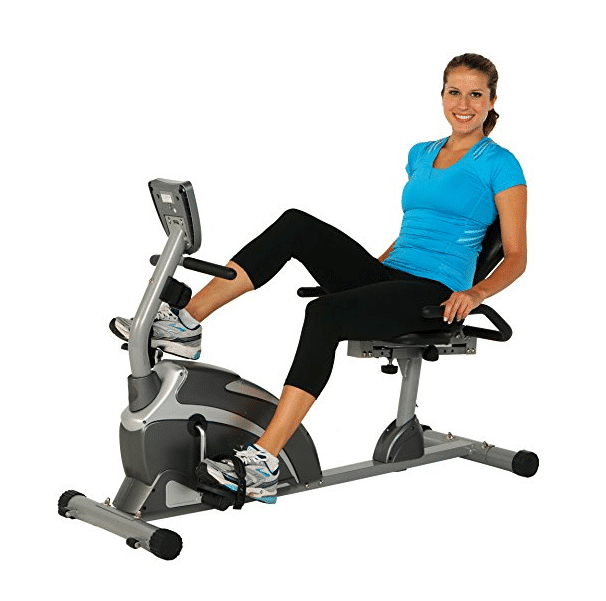 A cluttered home makes an unmotivated home – purchasing exercise machines are no different. Your Body: Lastly, you should consider what your body can handle. If you’re not sure if upright is right for you and your bones, you may want to go towards a recumbent bike. If you have a bad back, bad knees, or bad hips, an upright machine is definitely not the one you should hover towards. Before we set you off to go buy the recumbent bike of your dreams, you may be wondering which bike I chose for my gym. For me, it’s the Schwinn 270 Recumbent Bike. For the price you pay, you receive a ton of commercial-grade features that allow you to customize your workouts and monitor your progress all while charging your phone, listening to music, and keeping entertained. All in all, it’s a fantastic purchase and the best value for the money in home recumbent bikes.